Why Stop Now? tells the bittersweet story of Eli Smith (Jesse Eisenberg), a piano prodigy who, on the day of his audition for a prestigious music program, plans to enter his loving mother (Melissa Leo) into rehab for drug addiction. But, things don’t quite work out as planned and Eli soon finds himself having to work with her drug dealer Sprinkles (Tracy Morgan) while trying to make his own dream come true. During this recent exclusive phone interview with Collider, actor Jesse Eisenberg talked about why he was interested in being a part of Why Stop Now?, what made his character so relatable, preparing to do the piano playing himself, getting to work so closely with Melissa Leo, and what surprised him about Tracy Morgan, as a dramatic actor. He also talked about what he’s looking forward to with the animated sequel Rio 2, working with Richard Ayoade on The Double (a comedy about a man who is driven insane by the appearance of his doppleganger), creating the unique world of Now You See Me (a thriller about FBI agents tracking a team of illusionists who pull off bank heists during their performances), getting ready to shoot Night Moves (in which he’ll play an eco-terrorist), and being mistaken for Mark Zuckerberg at the Olympics. Check out what he had to say after the jump. Collider: Did you have any idea that an NBC commentator mistook you for Mark Zuckerberg at the Olympics? Did any of your friends text you to let you know? JESSE EISENBERG: I actually found out from the previous interview. So, how did you come to be a part of this film? Were you offered the role? EISENBERG: Yeah, they sent me the script and said, “Melissa Leo is doing this other role.” I thought it was a really wonderful dynamic between the mother and the son. I thought it was really unique. It just seemed totally authentic to me. I know these people. And so, the fact that Melissa was doing it made it that much more appealing. I really wanted to work with her, so I approved immediately. Could you identify with the aspect of this character having a talent and passion, but not quite having the belief that he could live his dream? EISENBERG: Yeah, exactly. That’s what’s driving him. He has this great ability and, at the same time, this great feeling of worthlessness that comes from having a troubled situation and the guilt that accompanies being great at something, in a situation that doesn’t always encourage you to be comfortable with that. That’s a sad rut to be stuck in, but is a really great story because it really centers on this guy figuring out that he’s good at this thing, and that’s okay. All these terrible personal circumstances can be separate. I see that all the time. Working in the arts, you see people who come from terrible circumstances and who, for whatever reason, have this incredible talent. But of course, with that great talent comes some guilt because, if you come from circumstances that don’t encourage it, it can be really confusing. What were the biggest challenges in playing someone who is trying to be disciplined while living in such a chaotic lifestyle? EISENBERG: He is that kind of a kid who had to grow up too quickly because his mom is not responsible, even though she’s a loving mother. He’s had to be her parent, in a way, and engineer her life while he’s trying to pursue his own goals and dreams. That’s just too much of a burden for a person. The story takes place mostly in a day, and it’s just this awful day where he’s both trying to do the greatest thing in his life, and dealing with the worst thing in his life. But, he has a good and constructive attitude, so the movie ends up being funny and sarcastic because he’s able to have this flustered reaction to all of it. Do you feel like most true artists really teeter on that edge of genius and madness, much like this character does? EISENBERG: I don’t know. I’ve met a lot of healthy people who are talented. I also feel like what drives somebody to have a unique perspective on something and be able to express it is maybe seeing the world in a way that is dissimilar to other people, and I guess that could cause them to look eccentric. So, maybe there is a correlation. What was it like to do the piano playing scenes? Do you actually know how to play the piano, or were there logistics involved with making it look like you could play? EISENBERG: I’ve played the piano since I was a kid. When I finally had the piece that we were going to do in the movie, which was written by a great composer named Jay Israelson, I was able to just practice it every day and be prepared for the shooting. With a story like this, did it help that the directors (Philip Dorling and Ron Nyswaner) were also the writers, so that you could ask them any questions you had? EISENBERG: Yeah, with a movie like this, where it’s such a personal story and it just feels very specific and authentic, you want to be able to work with the people who lived through it, as opposed to doing a big action movie where the writer probably didn’t have all the experiences of the guy disarming the bomb, or whatever. That was an advantage. It just created even greater specificity for what we were doing. How was it to spend so much of the movie with Melissa Leo and get to work so closely with her? EISENBERG: She was just incredible. Our relationship in the movie was fueled by our off screen relationship. She immediately embraced me as her son and immediately entered the relationship, in the same dynamic that the characters have. We were contentious and joking around, in the same way that the characters do. It was one of the thrilling experiences of my professional life because we had an immediate bond and dynamic that totally mirrored and fueled the movie, and that’s really rare. She’s just the greatest. I was so lucky to work with her, and I can’t wait to again. 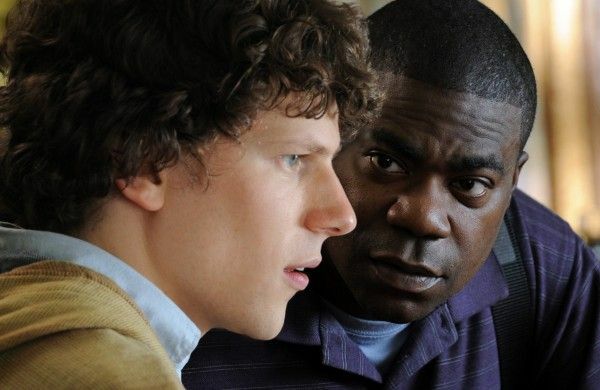 What surprised you about Tracy Morgan, as a dramatic actor? EISENBERG: I guess the first thing is that he is interested in doing that kind of thing because he has a really successful comedy career. The fact that he’s interested in doing that is already impressive because it’s a risk. And then, he does it well and he works at it. That’s the second most important thing. Just wanting to do it is not enough. He came prepared and worked at it, and he was aware of what makes it effective. He’s a really bright guy, so he knows how to use what’s in him to accomplish that. No matter the chaos that was going on in Eli’s life and with his family, the relationship between him and Chloe (Sarah Ramos) is really sweet. Was it always on the page that way? EISENBERG: Yeah, she was supposed to be the one light in this awful day. It changed a lot, over the course of rehearsing and figuring out exactly what that dynamic would be, and who would be pursuing who. And Sarah has this great balance of being really sweet to Eli, but at the same time, being suspicious of him and having a feeling of self-respect. She’s not going to chase after this guy, if he’s not going to be nice to her. That balance was so wonderful because it makes my character even more eager to get his life on track. If he gets his life on track, it could be so good, in every aspect, but he’s just so mired in self-doubt. That was a nice aspect of the story, and a good thing for my character ‘cause it motivates him to do well. 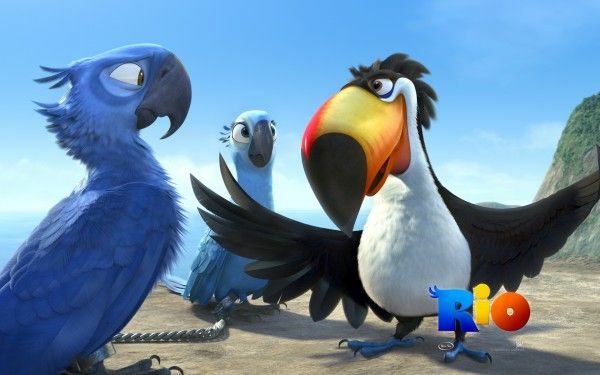 What can you say about Rio 2? Is it fun to get to further explore that character? EISENBERG: Well, we haven’t started it yet, but I look forward to it. It’s a pretty strange process that you do over the course of a year. I think the new story they have is really cute and funny. They allow me to bring my own sense of humor to it. It’s a lot of fun to do, but it’s hard to see, at the beginning, what it will be. It’s this extremely painstakingly long process. Every blade of grass in Brazil is drawn, so it takes so long to do. It’s hard to see what it is, as an actor, because I’m not there for the day-to-day stuff. But, it’s really cute and the characters that they’ve created are so sweet. Tracy Morgan was in the first one, and I don’t know if he’s in the second one, but it would be nice to be with him again, too. Do you think it will be any easier, the second time around? EISENBERG: Yeah, since I know what I’m doing, a little more. When I first started recording it, I downplayed it a little bit ‘cause that’s just my natural instinct. But, when I watched it back with that voice-over, over the course of the several months of recording, I realized that it probably works better, if you don’t downplay things too much. Because it’s not a visual medium for the actor, you can push it a little bit. You can be a little bigger and do a little more, as an actor. So, I know what I’m doing, a little more. What was it like to work with Richard Ayoade on The Double? Submarine had such a very unique style. How would you describe this film and its visual style? EISENBERG: They built an entire world for the movie. Every set was built. They basically built an entire city. It’s incredible! So, the style is so unique. It’s a funny movie, but it’s very dark and terrifying. This character that I play, his life is overtaken by his doppleganger, so he’s struggling for not only his identity, but his life. The style of it is so consistently dystopian that I think it will be just fantastic. It was really a weird world to inhabit, as an actor, and I imagine that, as an audience it will be as well because you won’t see the camera and it won’t take you out of it, like it did for me. What attracted you to Now You See Me, and what was it like to work with Louis Leterrier? EISENBERG: It’s a really unique movie. The cast was huge and, for each character, they cast these incredible actors. It was a surreal experience. Every day, there was somebody really interesting coming in. It was a really fun time. I played the world’s greatest mind magician. He’s able to manipulate people through these very elaborate tricks. It was such a creative experience because the filmmakers created these very elaborate tricks that were interwoven into this complicated plot where the FBI is trying to figure out how they’re doing it. So, on the one hand, you’re seeing these incredible things, as an audience, in the same way that an audience would be watching these magicians. And then, on the other hand, you’re trying to figure it out from the perspective of the FBI. It was a really interesting process. With all of the places you got to shoot in for that film (including New York, Las Vegas, New Orleans and Paris), which was your favorite? EISENBERG: We were in New Orleans for three months, and it was incredible. It’s such a wonderful city, full of its own unique culture. The magical aspect of the movie really fit there because it seems like a city that would just be perfect for magic. Strangers talk to each other on the street, and people perform all over, so it was perfect for our story and my character. What is it that attracts you to a particular project or role, these days? EISENBERG: I don’t know. I sign on to a lot of things, and then wait for them to happen. I’m signed on for a lot of movies that may not happen. If it seems like the character has something interesting to do, it seems like an obvious thing to look for, but it’s rare, too. 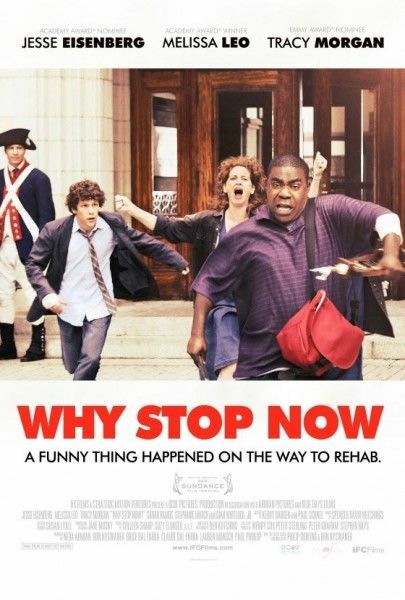 With Why Stop Now?, the dynamic between my character and Melissa Leo’s character was so unique to me and so authentic. It seems obvious to say that something seems authentic, but you just never see that. Most movie relationships are contrived versions of other movie relationships, and that wasn’t. It was like a real, lived-in thing. And then, to be able to do it with an actress like that, made it that much more interesting. With The Double, I got to play two characters who are very different guys. It was really interesting to be able to do that. Everything offers its own aspects and challenges. Do you know what you’ll be shooting next? EISENBERG: I think I’ll be doing this movie called Night Moves, that’s about an eco-terrorist. I think I’m shooting that in Portland, in a few weeks. I’m in England right now because The Double just ended.